The contrast is not between a temple which is overthrown, and a temple which abides; both temples are overthrown, for the one falls in the fall of the other; but the one rises the third day, and the other does not. Nor is it a contrast between a temple of murderers and a temple of saints, for in the supper-chamber it is said, One of you shall betray me. When the spiritual house falls, its stones also are scattered, not one of them shall remain upon another; not even that Stone whom Christ himself had named. Protest as he may, the word applies to him, ‘I will smite the shepherd, and the sheep will be scattered.’ But the stones of the old temple will lie, and not be gathered; the shepherd, being risen again, will draw his flock after him into Galilee. The prediction about the scattering of the sheep holds the same place as the prediction about the scattering of the stones: Christ says the one thing as he comes forth from the temple, and the other as he comes forth from the supper room. And both goings forth lead to the same place — the Mount of Olives (133). Some of these broader implications of St. Augustine’s ideas were doubtless in old Kaiser Karl’s head as he listened to the reader in his hall at Aachen. But probably the books of the City of God — which the biographer quite properly refers to in the plural, as a series rather than a unit — provided the monarch with amusement as well as instruction at mealtime. In these XXII Books of St. Aurelius Augustine the Bishop on the City of God against the Pagans one is charmed and sometimes confused by finding notes on almost every subject of human interest. The extracts from them which appear in the pages of the Breviarium Romanum for the devotional reading of the clergy do not deal with political theory but with the Second Temple, the names of the Prophet Hosea’s children, and the miracles of St. Stephen. Some other items to be found in the City of God are a sketch of the Assyrian Empire, attacks on the absurdity of paganism, discussions on the nature of time, the eucharistic sacrifice, and the main principles of social ethics, and a rhetorical passage on the wonders of nature. One never knows quite what is coming next, and doubtless Charlemagne, like many other readers since, found this one of the attractions of the work. It has the fascination of a book about everything (“The City of God,” in Roy W. Battenhouse, ed., A Companion to the Study of St. Augustine, 259). Perhaps you knew about this already. Perhaps you will tell me that if I were more familiar with 1 Maccabees, I would have known this already myself. Be that as it may, it was news to me when I read in Paul Cartledge’s The Spartans that King Areus I, who took the throne in 309, “was the supposed recipient (under the spelling ‘Areius’) of a letter from the High Priest in Jerusalem, appealing to the common ancestry of the Spartans and the Jews with a view to procuring Spartan aid against the Seleucid king Antiochus” (240). AREUS, KING OF THE LACEDEMONIANS, TO ONIAS, SENDETH GREETING. We have met with a certain writing, whereby we have discovered that both the Jews and the Lacedemonians are of one stock, and are derived from the kindred of Abraham. It is but just therefore that you, who are our brethren, should send to us about any of your concerns as you please. We will also do the same thing, and esteem your concerns as our own, and will look upon our concerns as in common with yours. Demoteles, who brings you this letter, will bring your answer back to us. This letter is four-square; and the seal is an eagle, with a dragon in his claws. “Jonathan the high priest, the senate of the nation, the priests, and the rest of the Jewish people to their brethren the Spartans, greeting. Already in time past a letter was sent to Onias the high priest from Arius, who was king among you, stating that you are our brethren, as the appended copy shows. Onias welcomed the envoy with honor, and received the letter, which contained a clear declaration of alliance and friendship. Therefore, though we have no need of these things, since we have as encouragement the holy books which are in our hands, we have undertaken to send to renew our brotherhood and friendship with you, so that we may not become estranged from you, for considerable time has passed since you sent your letter to us. We therefore remember you constantly on every occasion, both in our feasts and on other appropriate days, at the sacrifices which we offer and in our prayers, as it is right and proper to remember brethren. And we rejoice in your glory. But as for ourselves, many afflictions and many wars have encircled us; the kings round about us have waged war against us. We were unwilling to annoy you and our other allies and friends with these wars, for we have the help which comes from Heaven for our aid; and we were delivered from our enemies and our enemies were humbled. We therefore have chosen Numenius the son of Antiochus and Antipater the son of Jason, and have sent them to Rome to renew our former friendship and alliance with them. We have commanded them to go also to you and greet you and deliver to you this letter from us concerning the renewal of our brotherhood. And now please send us a reply to this” (1 Macc 12:5-18). This is a copy of the letter which they sent to Onias: “Arius, king of the Spartans, to Onias the high priest, greeting. It has been found in writing concerning the Spartans and the Jews that they are brethren and are of the family of Abraham. And now that we have learned this, please write us concerning your welfare; we on our part write to you that your cattle and your property belong to us, and ours belong to you. We therefore command that our envoys report to you accordingly” (1 Macc 12:19-23). It was heard in Rome, and as far away as Sparta, that Jonathan had died, and they were deeply grieved. When they heard that Simon his brother had become high priest in his place, and that he was ruling over the country and the cities in it, they wrote to him on bronze tablets to renew with him the friendship and alliance which they had established with Judas and Jonathan his brothers. And these were read before the assembly in Jerusalem. “The rulers and the city of the Spartans to Simon the high priest and to the elders and the priests and the rest of the Jewish people, our brethren, greeting. The envoys who were sent to our people have told us about your glory and honor, and we rejoiced at their coming. And what they said we have recorded in our public decrees, as follows, `Numenius the son of Antiochus and Antipater the son of Jason, envoys of the Jews, have come to us to renew their friendship with us. It has pleased our people to receive these men with honor and to put a copy of their words in the public archives, so that the people of the Spartans may have a record of them. And they have sent a copy of this to Simon the high priest'” (1 Macc 14:16-23). 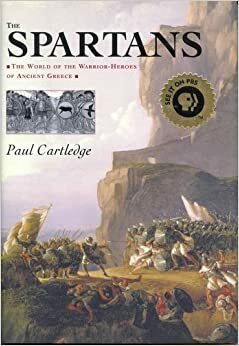 So, contrary to the impression Cartledge gives, it appears from both Josephus and 1 Maccabees that it was Areus who sent a letter to the High Priest of Jerusalem first, and — what is most intriguing to me — that he did so because of a writing that indicated that the Spartans and the Jews were both descended from Abraham. That’s not something you’d conclude from reading, say, Genesis 10. So what was Areus reading?